Signed and dated lower left: "Bill Scott 13"
Signed and dated lower right: "Bill Scott 12"
Signed and dated lower left: "Bill / Scott 12"
The paintings of Bill Scott reveal the miraculous duality of appearing spontaneous and energized, while simultaneously revealing a deep and thoughtful complexity. With this, the fifth exhibition organized by the gallery, Scott's oeuvre continues to evolve as his creative impulses remain fresh, and vital. Comprised of twenty paintings, one of the most striking themes of this show is Scott's presentation of “remembered feelings,” observations and memories drawn from nature, from objects in his studio and outside his window, and from his highly personal response to painter of the past. Instead of directing a painting where to go, Scott allows himself to be directed by brushwork, application of color, and line. During this process he begins to recognize elements that return him to a specific feeling or moment. The white form and undulating lines in Kimura's Garden (2013), for example, recall Chuta Kimura's Garden at Clos-Saint-Pierre (1984, The Phillips Collection), a work which the artist viewed in an exhibition at the museum in 1987. However, it was not until completion that Scott saw this connection. His sensual palette and intricate compositions elicit an uplifting effect in the viewer-his work is an affirmation of color, of the act of painting, and of an intricacy of forms that immediately draw the observer into his radiant visual world. 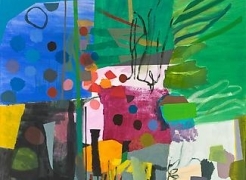 In two rich, vibrant paintings, Dream Flowers (2013) and Predilection for Spring (2012), the dynamic shapes and bold colors resemble nothing to that of an actual landscape. However, this cheerful moment is preserved, whereas in a living garden it would otherwise be fragile or fleeting. These new paintings also show an authoritative, mature hand-the artist's foray into a forceful, assertive style with vigorous brushwork that evokes power, gesture and a new dynamism. This much anticipated recent body of work will not disappoint. The exhibition is accompanied by a catalogue with an essay by Robert S. Mattison, Marshall R. Metzger Professor of Art History at Lafayette College and author of Robert Motherwell: The Formative Years (1987), Grace Hartigan: A Painter's World (1990), and Arshille Gorky: Works, Writings (2010).